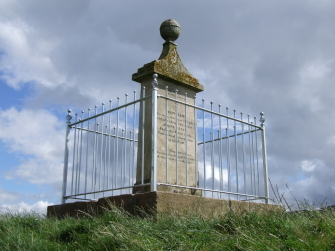 The memorial to Corson and Hair is located on an eminence to the south of the A 76, three miles east of the village, near to the Dumfriesshire boundary. A track from the A 76 leads towards it. The memorial is located within railings. The railings were replaced by the SCMA. often referred to the Waistland Martyrs) and martyrdom swiftly followed. they were found were enough to ensure their death and they were without ceremony shot on the spot'. said to be of ancient origin since it is often to be found in the form of Acorsane or Ap Corsane strongly suggesting a British or Celtic origin (cf. Owen Ap. Urien). With this strong association to Dumfriesshire and their place of martyrdom on the upper reaches of the River Nith it is fitting that the names of George Corson and John Hair appear on the wonderful Dalgarnock Cross raised in honour of 'The Nithsdale Martyrs'.